Chuck wants you to join! Josh Kantrow recently joined the NRA. I am a 53-year-old lawyer who lives in a trendy neighborhood in a large diverse city with my wife and three kids. I have never owned a gun. In fact, even though I grew up in Louisiana (“Sportsman’s Paradise”), I have never even pulled the trigger of any weapon except a BB gun. Yet, last week, I became a proud member of the NRA for the first time. I did so because the anti-gun hysteria that I’ve witnessed is dangerous, alarming, and ignores the facts. I’ve joined the NRA to stand up for them when they are viciously attacked, since the organization is a convenient scapegoat, not a cause of what happened in Florida. It seems to me, however, that the Left is not interested in sensible changes to existing gun laws, such as strengthening background checks, employing more armed security at schools, and better identification and separation of troubled youths. Rather, the Left wants to destroy the NRA and repeal the Second Amendment, as articulated recently by former Supreme Court Justice John Paul Stevens. I’m a Life Member myself. One Feedback on "Why a 53-Year-Old Big-City Lawyer Who Has Never Shot a Gun Joined the NRA"
I’ve been an NRA member for, I think, 45 years. Twice upgraded to Life and, then, Endowment Member. 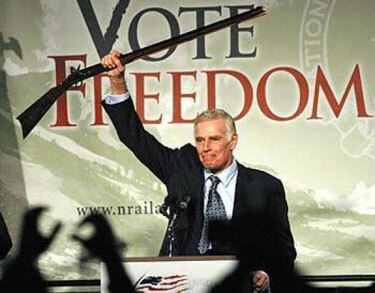 Monday morning I mailed to the NRA Political Victory Fund a $huge check. Typically, when the howling, idiotic liberals [redundant] waxed even-more-hysterical, I would buy more ammo, but we’re running out of storage space. The left hates 63,00,000 of you and me.